In an effort to end Swedish dominance in northern and central Europe, an alliance that included Russia, Denmark/Norway, Saxe-Poland-Lithuania and eventually Great Britain fought Sweden (with a little help from the Ottoman Empire) in the Great Northern War (1700-1721). When Peter the Great (1672-1725) reclaimed Saint Petersburg from the Swedes in 1703, he determined that a fortress was needed to deter any future attacks. Peter and Paul Fortress was founded on a small island in the Neva delta on May 27 1703, the day that is now considered the city's birthday. The initial version of the fort was completed within a year, and made of earth and timber. From 1706 to 1740, it was rebuilt in stone. The Peter and Paul Cathedral was built within the fort's walls from 1712 to 1733. Unfortunately for those hoping to see the fort in action, Sweden was defeated in 1721, and Peter and Paul Fortress was never used for its intended purpose of herocially defending Saint Petersburg from the bloodthirsty Swedes. Peter and Paul Fortress was instead used for many years as a prison: It was sometimes referred to as "Russia's Bastille." Its first inmate was Peter the Great's own son, the recalcitrant Alexi Petrovich Romanov (1690-1718), who admitted (under torture) to plotting to overthrow his dad. Alexi died on June 26 1718 after receiving numerous strokes with the knout, a multi-tailed whip that seems reminiscient of the cat o' nine tails of British naval lore. Other guests of the fortress included writer Fyodor Dostoyevsky (1821-1881), Leon Trotsky (1879-1940), and Yugoslav leader Josip Tito (1892-1980). During the Russian Revolution, Peter and Paul Fortress was passed back and forth between the Reds and Whites a few times. Prisoners were released, to be replaced with prisoners loyal to the Czar. Thirty or so shells were fired from the fort at the Winter Palace on October 25 1917, inflicting very little damage. In 1924 most of the fortress was converted to a museum. In 1931 a laboratory lovingly devoted to developing poison gas was added. In the Second World War (1939-1941) the fort was severly damaged by German bombardment during the city's siege, but it was repaired after the war. Most of Russia's Czars from Peter I to Alexander III (1845-1894) are interred at Peter and Paul Cathedral. Nicholas II (1869-1918) was notably absent until he and his family were canonized and the last Czar was interred in his proper place in 1998, 80 years after his murder. 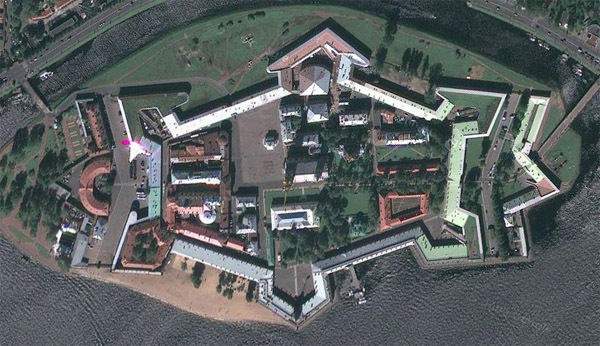 Today much of Peter and Paul Fortress is open to the public. But it's closed on Tuesdays. You have been warned.